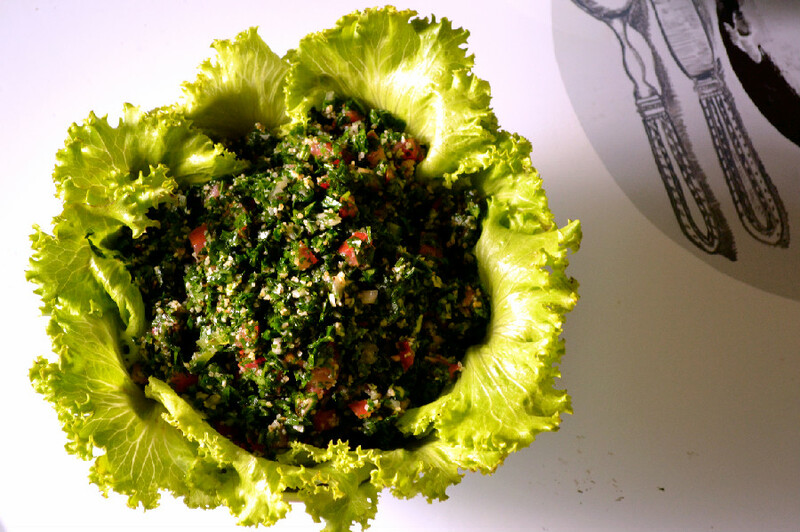 Tabbouleh needs no introduction; after hummus and falafel it’s probably one of the most internationally recognized dishes in Lebanese cuisine. It originated in the mountain regions of Syria and Lebanon and became a popular salad or mezze (antipasto) throughout the Middle East. It’s raw, vegan, healthy and antioxidant rich by nature and it has been so since inception, long before it was trendy to be any of these things. Tabbouleh was ahead of its time. Tabbouleh should be a vibrant leafy green pile of chopped fresh parsley with speckles of bulghur wheat, diced tomatoes, onions, and mint and should be simply seasoned with fresh squeezed lemon juice, extra virgin olive oil and salt. Some people use fresh mint, others prefer fresh dried mint (mint that has been dried from fresh mint leaves at home). Its traditionally served over a bed of crispy romain lettuce, which is then used to scoop it up by the mouthfuls. Some prefer to use pita as it soaks up all the juices. Some like it best fresh, others prefer it days after it is made. 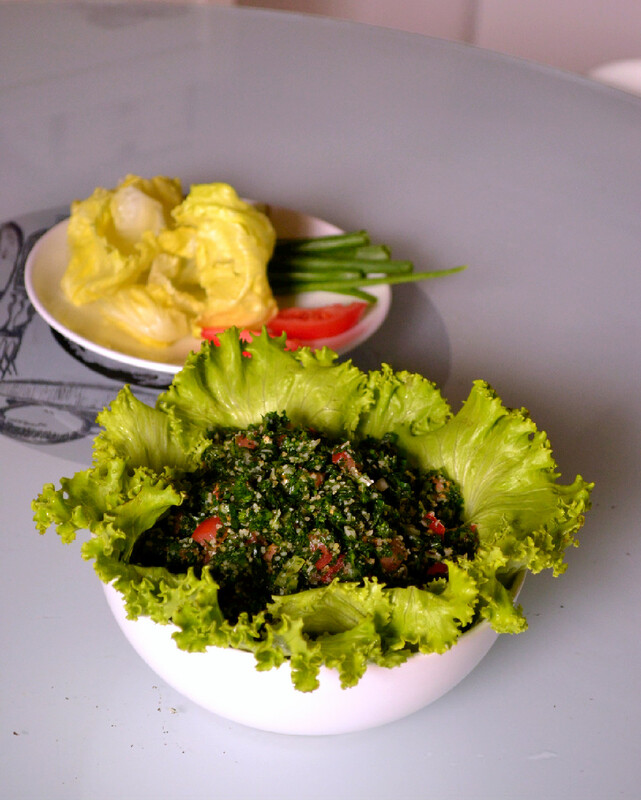 Every Lebanese family has their own way of making tabbouleh, each traditional and tasty in its own right. There is only one rule that MUST be adhered to and it’s that parsley IS the hero, as it should be, in any traditional tabbouleh recipe. Thankfully Parsley is a super food that is loaded with antioxidants, an excellent source of vitamin C and folic acid. If that’s not enough, it helps detoxify and purify the blood, reduce blood pressure and enhance kidney function. I could go on signing parsley’s praises for pages on end, but you get the drift. This is my Mama’s recipe, a traditional Lebanese recipe, passed down for generations in my family and now I’m passing it on to you. 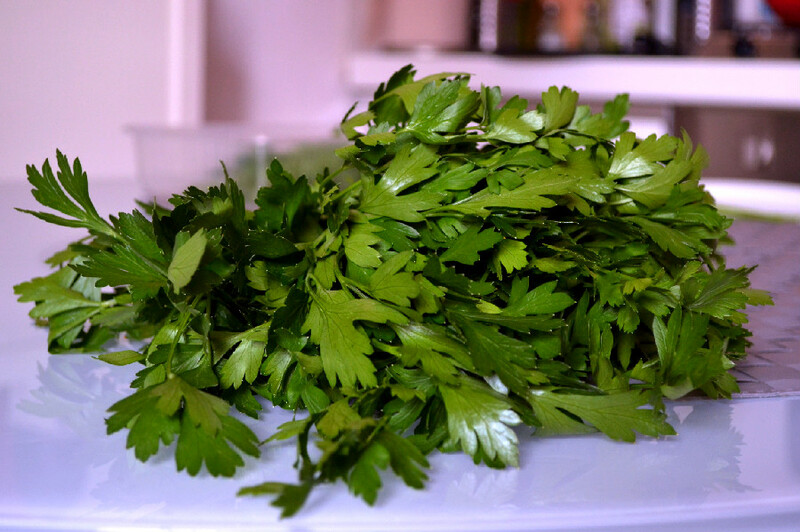 Wash chopped parsley thoroughly and let drain in a fine mesh strainer. Meanwhile, dice tomaotes and green onions and set aside. Sprinkle the white parts of the green onion with a pinch of salt and pepper to allow them to release a bit of their juices. In a large mixing bowl, add parsley, burghul, diced tomatoes, green onions (green & white parts), dried mint, and sea salt. Add lemon juice and EVOO just before mixing. Let the flavours settle for 10-15 minutes and serve with pita bread and/or lettuce. 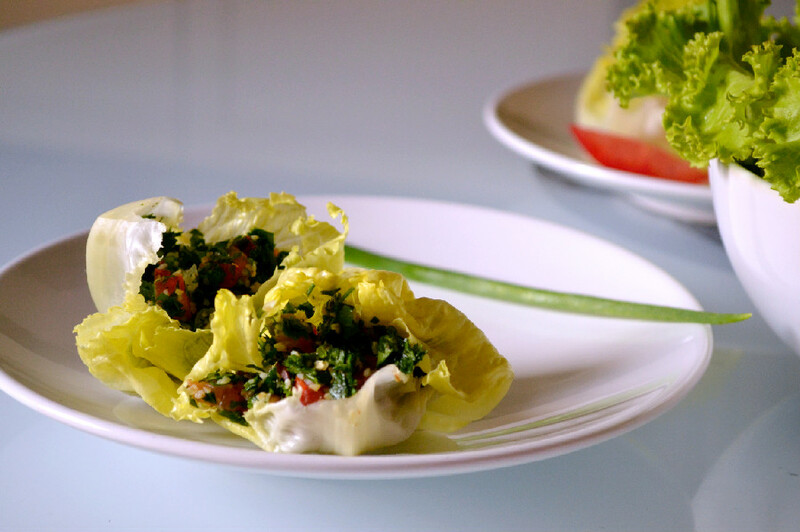 For a nice presentation, transfer to a serving bowl lined with romain lettuce leaves, use romain lettuce leaves to make tabbouleh boats or iceberg lettuce leaves to make tabbouleh cups. This is such a beautiful recipe, Nissrine! I mentioned it before, but you really rock at these middle eastern recipes 🙂 Love the leafy goodness it’s wrapped in too. Thanks so much Audrey. All my middle eastern recipes I learned from my mama. She’s an awesome cook. 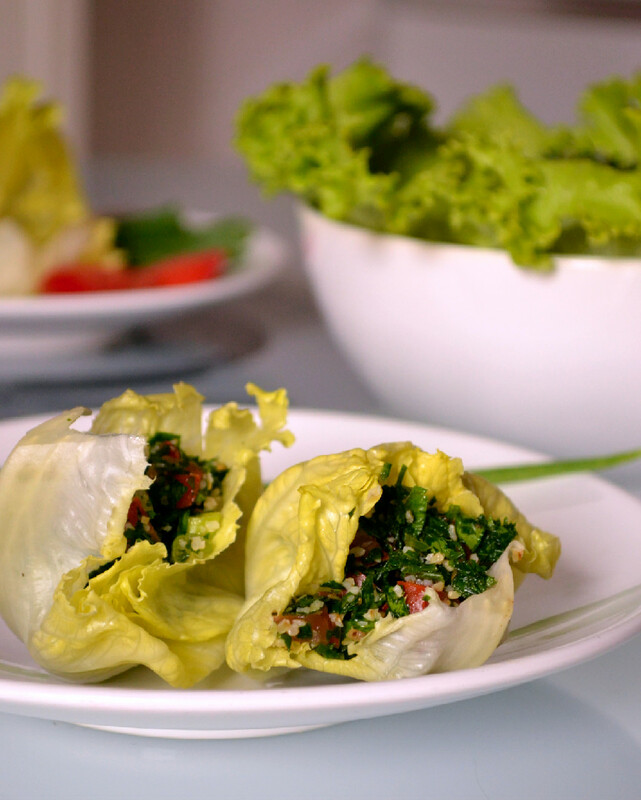 As for the leafy goodness, that’s the best way to eat tabbouleh, tucked inside a crisp lettuce cup or boat. So yum. I made it for dinner a couple of nights ago and it really hit the spot.